Dan Davis takes a look at the standout players during the U17 World Cup semi-final that finished Spain 3-1 Mali. The first semi-final of this year’s U17 World Cup was billed as a clash between two of the most attacking teams throughout the tournament, with Spain’s more possession-based system contrasting to Mali’s faster-paced offensive game, leading to 15 goals in five matches for the Spaniards’ opponents. The opening stages of the contest lived up to the watching supporters’ expectations, as the Mali goalkeeper, Youssouf Koita, was forced into a wonderful save in only the first minute. Abel Ruiz swung in a dangerous delivery, and the ball fell to Sergio Gomez who fired towards goal with a first time volley. From point-blank range, Koita was quick to throw himself down and tip the ball away from the target. And with only one attempt from Mali troubling their opponents, it was Spain who opened the scoring just shy of the 20-minute mark. Cesar Gelabert was played through on goal, but Abdoulaye Diaby sliced him down leaving the referee no choice but to point to the spot. Abel Ruiz stepped up and duly dispatched the penalty straight down the middle, handing his side a deserved lead. More good pressure from Spain after the cooling break resulted in them doubling their lead on the stroke of half time. The ever-deadly Gelabert threaded a wonderful pass through to the striker Ruiz, who opened up his body and stroked the ball home. Spain continued to dominate proceedings until the hour mark, until controversy struck, almost akin to Frank Lampard’s ricochet into the net via the crossbar at the 2010 World Cup. Cheick Oumar Doucoure unleashed a pile driver towards goal, which thundered off the underside of the crossbar and looked to land over the line before bouncing out. The referee had no goal line technology to aid his decision, so decided not to award the goal, to the anger of the Mali coaching staff. Ten minutes later, Spain capitalised and ensured they would be the team to play England in the final. Ferran Torres headed in from a Sergio Gomez delivery, and had all the time in the world to pick his spot after being unmarked in the penalty area. Just as the game appeared to be over as a contest the Spaniard back line switched off, allowing N’Diaye to find the target and drag his team back into proceedings. The final stages of the tie were played out with Mali pushing forward, but the Africans were unable to beat Alvaro Fernandez in the Spanish goal again. Here are the standout performers during this terrific, attacking semi-final clash. The Spanish scoring sensation has single-handedly lit up the U17 World Cup this year in India, and it should come as no surprise to anybody that he is currently on Barcelona’s books. Despite his lethal finish, the player will be a free agent in 2019 and only holds a buyout clause of 3million euros. With six goals in six matches, and two more to add to his tally in this semi-final clash, Abel Ruiz looks to be a player to watch out for in the future, even if he fails to progress through the Barcelona B system. Against Mali, the striker showed his prowess leading the line, with a deadly combination of his first touch, assurance in front of goal and the timing of his runs meaning he was a constant nuisance to Spain’s opponents. His first goal came from the penalty spot, but Ruiz showed his confidence as he fired home down the middle of the goal, after Koita had thrown himself to his left-hand side. As his team continued to dominate, Ruiz received a pinpoint pass from his team-mate Gelabert, and the striker found himself clean through on goal. With only Koita to beat, the talented Spaniard opened his body up and slotted the ball home comfortably, showing his composure in a situation where many others players his age may not have done. When the talented youngster didn’t start for his country in the U17 World Cup opener, he may have feared his minutes throughout the tournament would only be limited. However, he has since played a large part in guiding Spain’s youth to the final. The Spaniards lost to Brazil in their opening game of the tournament, and demonstrated many sluggish elements to their game – a complete contrast to the team’s performance in the semi-finals. With the introduction of Gelabert, Spain became a much more composed unit, and began swatting sides away with relative ease. The talented youngster would have stolen the show against Mali, if it wasn’t for the goal scoring exploits of his teammate, Abel Ruiz. Gelabert drove at the heart of the Africans’ defence to great success, and won the penalty which handed his country the lead. After this, his ability shone through as he continued to carve out chances, with his impressive range of passing proving to be a real asset to Spain as they flooded forward looking to increase the lead. The second goal came from Gelabert’s incisive passing, as he played through Ruiz who duly converted to hand Spain a comfortable lead heading into the half-time break. Despite the relative ease of the second half for his country, Gelabert still continued to drive forward in the hope of creating or scoring more goals, and his determination will be extremely useful in the final showdown against England. 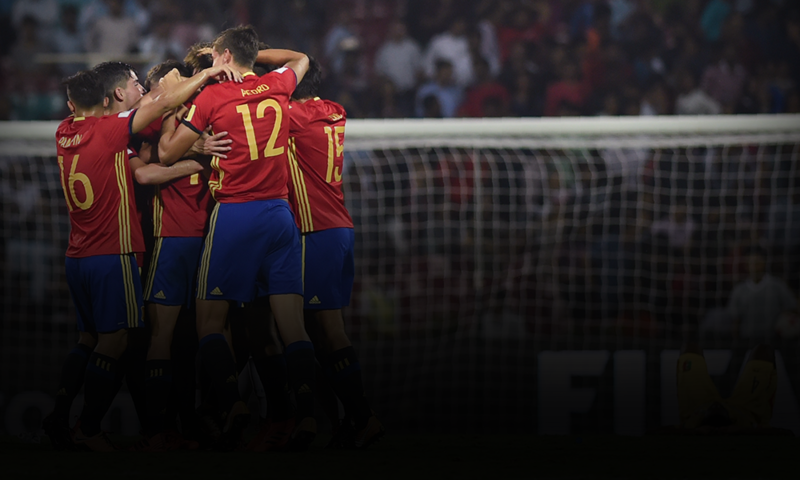 Despite the clash being built up as a scintillating tie between two attacking sides, Spain managed to seize control of proceedings from minute one and never looked back. This meant that Lassana N’Diaye found himself fighting a losing battle throughout most of the game, as his teammates struggled to carve out chances. His late consolation for Mali marked his fifth goal of the tournament, and when he did manage to run at the Spanish defence, he was able to cause problems. Mali have been so effective in this tournament through their fast-paced offensive play, with N’Diaye being utilised in the system to spark attacks, and also finish them off. However, Spain’s performance was so dominant that N’Diaye’s performance was noticeably stifled. Despite the three goal deficit, the Africans’ continued to press for a goal, and N’Diaye was the player who found the back of the net once again. The country’s top-scorer converted tidily at the near post are being played one-on-one against Fernandez, but was unable to drag his team back into the tie, meaning Mali bowed out at the semi-final stage and Spain progress to play England in the final.